As Hampton Bed Company stockists both the Heritage Pocket Collection and Adjustable Bed Collection are now available to buy at Harvest Moon. The Hampton Bed Company offers a return to traditional, proven values and materials, beautiful pocket spring beds where comfort, luxury and style are the core requirements and a perfect nights' sleep for everyone is the ultimate aim. The image above shows a Hampton Bed Company Heritage Collection Westminster 5000 pocket spring divan bed set in our Southport furniture showrooms, also shown with a Willis and Gambier Ivory headboard (available to buy separately). The Hampton Bed Company make a beautiful Heritage range all hand finished in the UK in the same traditional method of construction - side stitches, the best natural fillings including white cashmere, silk, wool, cotton, mohair and horse hair in all sizes up to 6ft super king. A range of motorised adjustable pocket spring beds is also available. We offer Hampton Bed Company divan beds in the following sizes: single bed, double bed, king size bed and lastly as a super king size bed. Please note not all beds are available in all sizes. For all the latest from the Hampton Bed Company click here to go direct to their website for the full selection of beds and mattresses available. Simply choose what you want from their website and ask us for a price. We offer a rapid 14 to 21 days two man home delivery to UK mainland addresses on all Hampton Bed Company orders! For complete divan beds the cost is £60 and for just a mattress it is £40. 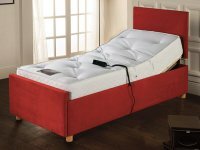 The Hampton Bed Company Adjustable bed collection includes adjustable beds that are very popular with the immobile and the elderly for helping with getting a peaceful night's sleep. 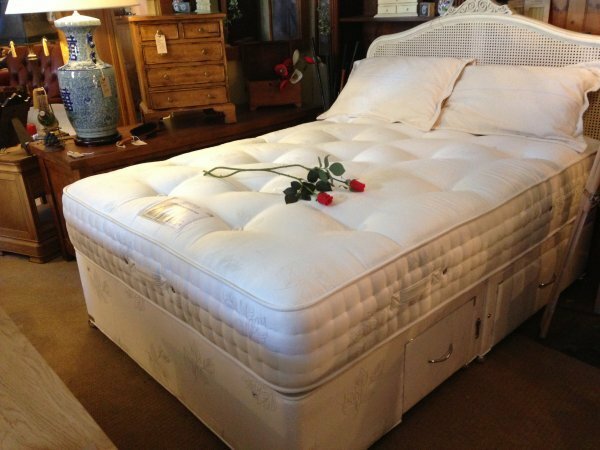 The bed models in the range are the Memory Relax, Hilton and Windsor adjustable beds. Optional storage drawers, massage unit, headboard, footboard, side retainer bars and a choice of different fabric options and legs are all available to order. Click on the link or the image above to view the Hampton Bed Company Adjustable Beds Collection. The Hampton Bed Company Heritage Pocket Collection has 6 sumptuous bed sets - the Belgravia 7000, Westminster 5000, Kensington 3000, Mayfair 2000, Knightsbridge 1500 and Chelsea 1000 and 3 upholstered headboards - the Dorchester, Banbury and Cambridge. Storage drawer options and choice of medium, firm or dual tension available and all the Heritage Pocket Collection mattresses featured can also be bought on their own. The Heritage beds have individual pocket springs with Active Support technology in the mattresses and superior fillings for maximum comfort. Click on the link or the image above to view the Hampton Bed Company Heritage Pocket Collection.